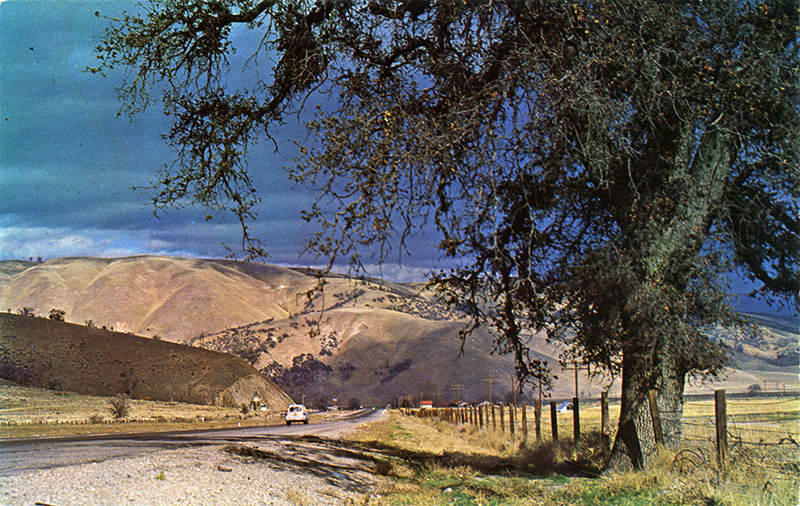 SCVHistory.com LW3300 | Ridge Route | Approaching the Grapevine on U.S. Highway 99, 1950s-60s. Highway 99 approaching the Lebec curve (and Hotel Lebec) from the south. Castaic Lake (not to be confused with DWR Castaic Reservoir) would be off to the right in the distance. Kern County Fire Station 56 was built in 1988 at this location (1548 Golden State Highway, right-hand side of the road in this photo). Real photo postcard, 1950s or early 1960s; the vehicle might be a 1953 Ford Ranch wagon. Todd Spiegelberg notes that yellow license plates (like this one) were issued in 1956; black plates were issued in 1963. Highway 99 between Los Angeles and Bakersfield is well known as "the Grapevine." This is now a multiple lane divided highway with easy grades, but years ago was a tortuous narrow road. Color photo by Louis & Virginia Kay / No. 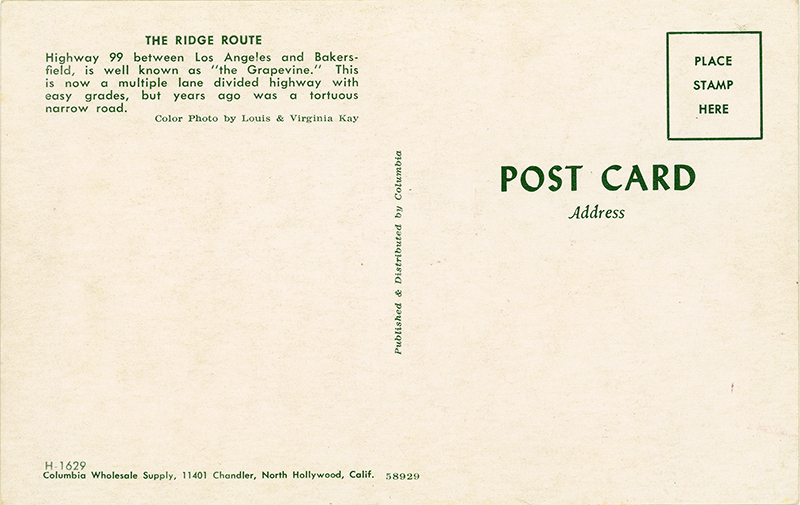 H.1629 / Published and Distributed by Columbia Wholesale Supply, 11401 Chandler, North Hollywood, Calif.
LW3300: 9600 dpi jpeg from original postcard purchased 2018 by Leon Worden.